My 2014 was a series of interesting personal events and some upheaval. Being in a new place has been fun and there have been stretches of mind numbing soul killing boredom as well as a lot of fun. I decided at the beginning of 2014 I was going to get out and try new things and reacquaint myself with some old activities and try to meet some new people along the way. I succeeded in some ways and crashed and burned in others. My goals for the new year are to take my motorcycle to the remaining three ferries I have yet to visit in the Province of Alberta. My best friend and I hope to pull off a trip to the west coast to Victoria, British Columbia by motorcycle from Airdrie, Alberta. I have the barest outline of a plan to ride over the Beartooth Highway in Wyoming. Along the way I am looking to meet some new people and with luck to make a few new friends. For anyone that reads this I sincerely wish everyone a memorable 2015 with lots of high points and very few low ones. All the best to you and yours. This waterfall is located in Yoho National Park near Field, British Columbia. The falls have a free fall of over 830 feet. From the parking lot there is a trail where you can hike right up to the falls. The road is a bit of fun as well. Take Yoho Valley Road from the Trans Canada Highway about eight miles to the falls. The road is paved but it is narrow in places and there are two switchbacks making it impossible to tow any trailers past them. You are right in the Rockies and the trip is well worth it. View from the trail. It is a little bit of a hike. View from the base of the falls looking down into the valley. Range Road 40, close to Township Road 502, near Genesee, Alberta, December 26, 2014. It looks worse than what it is, about an inch of snow on the ground. The light this time of year tends to make things look bleaker than what they are. A thank you to my cousin Chris (Christine) and her significant other Rob, for letting me bunk at her place that night. Groundwork was laid for a trip to the Klondyke Ferry north of Barrhead, Alberta this coming May. A friend of mine let me know he was coming to Calgary for a few days. We had kind of lost track a bit through the years. I was recently trying to reconnect by email. I was pleasantly surprised when I received an email saying he was going to be in town for a few days. We had spent high school in a small town in British Columbia together and we both ended up in Calgary at different times. He graduated from university and moved to Brunei. He was originally from there and on his return ended up taking over a family business. Over time he opened up Pizza Hut franchises in Brunei. He would drop back into Canada intermittently through the years but the gap was longer this last time. Stories for another time. When he and I lived in Calgary we spent too much time playing pool at a place called Sunset Billiards. The place was open from nine to five, being nine in the morning to five in the morning. The hours did not make any sense and neither did playing until we shut the place down on a frequent basis. For some reason the guy running it liked us and let us play for hours on end and never charged us. More than a few times we played for eight hours at a time for nothing. The money we saved playing eight ball and snooker got eaten by a coin operated tabletop hockey game. One time when we were playing the hockey game a guy came in and declared he was the Canadian champion, we laughed at this, and he pestered us until we played him. I played him first and shut him out. My good friend played him next and shut him out by a larger margin. He then left us alone. I still don't believe there is a Canadian tabletop hockey champion but there seems to be a champion for everything these days. When Sunset Billiards closed at five in the morning we would go over to Chinatown and finish the day with beer, special fried rice, and salt and pepper squid. Why? Chinatown was close and places were open for some reason. For the record, he is Chinese and I am not. Sunset Billiards and our Chinese restaurant disappeared years ago. You are hard pressed to find a pool hall anymore that is just for pool. Regardless, I met my friend at his downtown hotel and we found a pub and downed a few beers and caught up. As luck would have it, across the street was a bar with pool tables that were in great shape. Even though the place was booked with two Christmas parties they let us play on a table that wasn’t in use. For a guy that hadn't played in years he was suspiciously good. I managed to hold my own. The visit was close enough to old times that the intervening years didn’t seem to matter. We left, sobered up in the night air, and parted company. He flew out to visit family for Christmas. I truly hope he had a wonderful Christmas visiting family in Vernon, British Columbia and I wish him all the best in the New Year. My plan is to save my nickels and visit him overseas sometime in 2015. About fourteen miles north of Drumheller, Alberta is the Bleriot Ferry. If anyone is ever in the Drumheller area during the summer I highly recommend taking this short side trip. The prairie scenery is pretty mundane until you get to Drumheller. Then things change to small canyons, hills, and hoodoos. Everything is paved, the roads are in great condition, and this is a perfect trip to take on a motorcycle. All of the ferries in Alberta are run by the provincial government and are free. I took Highway 837 north of Drumheller which follows the west side of the Red Deer River. There was not much traffic for being in the middle of a very sunny day. About halfway to the ferry the highway climbs up from the river valley onto the open prairie. I had the trusty Suzuki Burgman going at a nice clip when I hit the brakes after noticing the Orkney Viewpoint sign. I hesitated slightly, then turned to check it out. The viewpoint is just off the highway and gives a great view of the river valley. If I had my telephoto lens I could have got some great shots of people rafting down the river. The Red Deer River moves so slow I could tell the rafters were not getting anywhere in a hurry. A short distance up the road is the junction for Highway 838 which takes you east to the ferry. The highway takes a nice descent down into the river valley with some great curves and the road flattens out at the bottom. This ferry is a heavy tourist attraction and gets a lot of traffic. It is easy to see why. The setting is fantastic and the road is a fun drive and paved. The guy who runs the ferry has to have a great job. As soon as people get on the ferry he is instantly asked to take people’s pictures. The operator that was there really enjoyed his job and interacting with all of the tourists. The only real problem with the Bleriot Ferry is the ride is too damn short. I was tempted to ride the ferry back and forth a few times just for fun. On the other side the highway climbs up from the valley onto familiar prairie once again. The road loops back to Drumheller on the other side of the river and it is a short trip. As an aside, you notice things differently on a motorcycle. I find the air is different from the river valley to the prairie and you have to love the smell of fresh cut hay. I notice more on a bike, and the experience is different, even better than being in a car. The highway is a good enough ride that I thought about what it would be like to have it blocked off for my sole use and go flat out without the worry of encountering any traffic or obeying any speed limits. The road is known as the dinosaur trail. Dinosaur finds are still being unearthed in the area and people stumble across bones here and there. The place kind of looks like the kind of place where you expect to find that sort of thing. Watch out for snakes, there are supposed to be rattlesnakes in the area if you go exploring. I have yet to see any though. I wish everyone a Merry Christmas and may you get your share of the holiday loot! This is a backcountry single lane gravel and rocky road west of Calgary that runs for about thirty five miles. The bridge in the picture was washed out in the floods of June to July 2013. It looks like this newer bridge is supported by a large steel I-beam and is meant to withstand any future flooding. Some government agency spent a fair amount of money to put this bridge in. I think it would have been a minor challenge to bring the bridge materials in since this is a narrow winding twisting road. At the time this was taken October 26, 2014 you could forgo the bridge entirely and easily drive across the creek. The woods were crawling with hunters so I understandably did not see any wildlife. I saw this guy in the parking lot on my way in. I was really tempted to do the same thing. Sunny and just above zero on December 21, 2014 and people are out with their motorcycles in the Calgary area. Highway 40, Alberta. This is the highest paved pass in Canada in Kananaskis Country, Alberta, about an hour and a half west of Calgary. It was a little chilly and very light snow when this was taken. This is a great trip on a motorcycle and is a popular highway with the biking crowd. Take a camera if you ever take this highway, there is usually a fair amount of wildlife to see. Redwood Creek $8.45 Canadian including taxes at the till. It is a California wine and it tastes great. I have no great insight to offer other than I give it a 9.5/10 on my completely subjective scale of whether I like something or not. I will definitely buy this again. Bought at my friendly neighbourhood Superstore Liquorstore. The Bailey bridge is a type of portable, pre-fabricated, single-lane truss bridge developed by Donald Bailey during the Second World War. The bridge itself was steel and usually had a wood deck. They were strong enough to handle tanks. You used to see them frequently, especially after washouts. I can remember places where I lived in British Columbia where raging creeks and rivers would wash out bridges and Bailey bridges would be thrown up to restore traffic. They were a common site on gravel highways and on a lot of logging roads. They have disappeared over the years being replaced by other bridges. This one is at Seebe, Alberta. There really isn’t anything at Seebe except for this bridge that branches off from a secondary highway to cross over to a dead end on the other side where there is a rest stop. Many, many years ago there was a general store. Whatever once was here disappeared years ago. I like the visual of the photos though. If anyone is feeling generous . . .
Found at a liquor store in Calgary, Alberta. I have a lot of relatives. This is from May 21, 2014 at one of their farms. Always pass a cattle carrier at your earliest opportunity. You literally see these things practically all over Alberta. They are in farmer’s fields, out in the bush, and in some places like Drayton Valley they have built houses around them in housing developments. These are three picture of the same pumpjack that went from bare land to what is pictured in less than a month. The rig mats are needed to deal with the mud. It’s not all cattle country in Alberta. A person should have a few goals and interests. Mine are varied and uncomplicated. One of my ongoing quests is to find a great cup of coffee. Most coffee is usually just okay. Personally I usually drink a couple of pots over the course of a day just for maintenance. Sometimes, just on a rare occasion, you run across that cup of coffee that makes you stop and think to yourself, "Damn, that is a good cup of coffee." I do have a coffee place that I have been going to off and on for a little over twenty years that is located in Calgary. I think the same guy has owned it since the beginning. It also has not changed in that time. I happen to like places that have character. The staff and the clientele are a bit different, sometimes downright unusual. A lot of times both groups sport the homeless look. Years ago they used to serve coffee in bowls, I wish they would bring that part back. Nothing like keeping your hands warm by sipping a bowl of coffee in chilly Calgary weather. The place is small. There are sacks of beans that the owner roasts himself. If you want sugar there is demerara available. You can usually see burlap sacks of beans in the corner. Old coffee grinders and assorted vintage coffee stuff are stacked up behind the counters and on the walls. A collector would love this stuff. When I lived in the Edmonton area I would drive three hours on a weekend just to get coffee from here and then drive back. You have to have priorities. I was there on the weekend and got my fix. I asked for a few business cards prior to leaving. Any place that I really like I always try to turn people into converts. That is why I wanted the cards, to hand them out. They didn't have any. Instead the guy folded up a bag that you would put ground beans into. When he was done the folded area was about the same as a business card. I think they may have stumbled on a new marketing tool. My quest for the best steak and eggs is another story. There are lots of times when I am driving out in the country and I see a field littered with round hay bales. It always looks like a neat visual but it never seems to look “right” when I take a picture of it. Something gets lost in the translation. Not to say that I won’t keep trying. 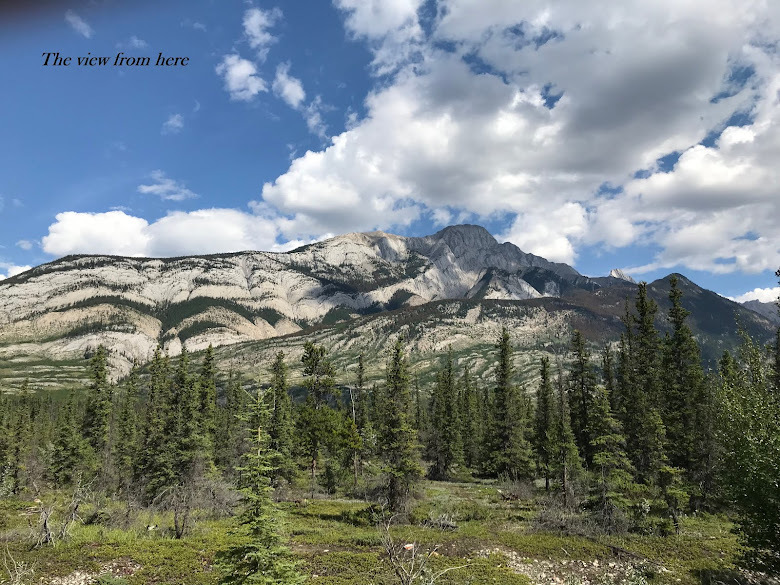 I took this while walking in Yoho National Park on my way to a waterfall in the area. I noticed the bird in the tree and walked up to within three feet of it at eye level. The bird, a magpie I think, let me take about four pictures before flying off. This turned out to be the best shot. Near Wayne, Alberta taken on September 21, 2014. Likely an old coal line. Canada is not like the US when it comes to cheap inexpensive wine. It is slightly difficult to get anything that is truly low priced due to all of the taxes. So my arbitrary rules are that any wine that I come across should be no more than ten dollars a bottle Canadian including tax. It should also be red. I automatically reject anything from Gallo. That is pretty much the extent of my rules. I occasionally drink red wine simply because I occasionally like to drink red wine. No mystery. I have been to a number of wine tastings mainly because someone had a spare ticket and I got nominated to attend. I have tried expensive wine that can be every bit as bad or good as the lower priced stuff. I never understand all of this smelling and swirling wine in a glass, I think you know right off if you like the stuff or not. Some wine does need to breathe and some tastes better if you aerate it. Personally if I want to drink something I just want to crack it and drink it. I tend to be impatient. I recently stopped into a local liquor store that was gloriously disorganized and noticed a clearance bin. I would guess these people had never taken inventory or knew what they had for stock. I asked how much, was quoted ten dollars, ran it through the till and it came to exactly ten dollars. The owners are either burying the sales tax in the price or quietly ignoring it. No matter, not my problem. French Maid Merlot is actually French. I was kind of let down when I cracked the screw top at my cousin’s place. I was initially disappointed because I could have sworn I bought Pinot Noir. This is surprisingly good. It is smooth with no unpleasant aftertaste. My cousin, her significant other, and I all liked it and agreed to give it a seven out of ten. I would buy it again. 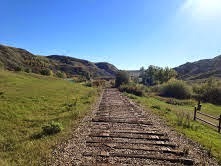 Wayne, Alberta was the site of several coal mines and once had a population of over three thousand. That was over fifty years ago. All that really remains now is the hotel that was built in 1913 which is a popular spot in the summer. The road is about five miles off the highway to the hotel and is paved all the way. It is a winding road that crosses the same creek nine times until you get there. The bar was packed inside and out and there was live entertainment which was some kind of original folk music. Mercifully they stopped just shortly after my arrival. If you are ever in the area make sure you stop.